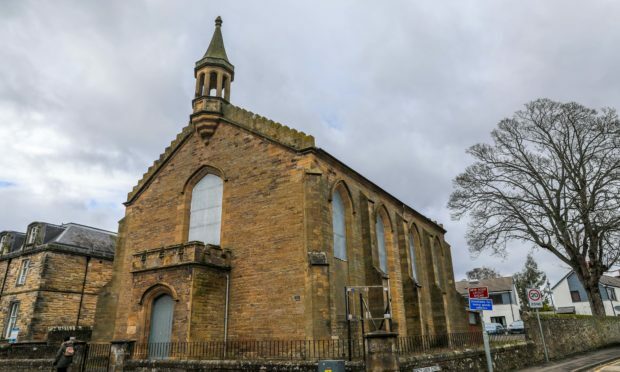 Members of north east Fife’s planning committee have backed a blueprint to turn the listed former St Michael’s Church in the town’s West Port into nine new flats after the building lay vacant for years. Built in 1837 to accommodate the growing congregation of Cupar parish, the church was most recently used as Bell Baxter High School’s gym hall – although it closed a number of years ago and has since been allowed to fall into disrepair. The large windows have been secured with metal boards and the building has been subject to vandalism over the years, but Perthshire developer Craig Daly’s vision for the prominent site will see the relatively modern extension to the rear of the church demolished and the nine new properties created inside the distinctive building itself. Cupar Liberal Democrat councillor Margaret Kennedy echoed the sentiments of her fellow committee members when she said she was “delighted” to see the church building being brought back into use, although she urged the developers to take cognisance of the fact it was in a town centre location and near a primary school. “We have a primary school next door, we’ve got safer routes to school but there will be site deliveries and site traffic so I would hope that the site management plan put in place will demonstrate respect for the area,” she noted. Committee chairman Donald Lothian moved approval of the plans with a condition that the applicant heeds recommendations about measures to mitigate the effect on the local bat population, and takes into account the proximity of the school and the movement of school pupils. But Ms Kennedy went further than that, tabling an amendment calling for an additional condition to be added to consent in relation to construction working hours. The committee subsequently voted 10-2 in favour of her amendment. Liberal Democrat councillor Bill Porteous pointed out that the church had been used as a chapel of ease in the 19th century but had fallen into substantial disrepair – so much so that it is included on the Buildings at Risk register. “What a metaphor for Fife Council’s public buildings this one here is,” he added. Six objections had been lodged by local residents, mainly in relation to traffic concerns and the loss of six parking spaces which have been used by members of the public of late. However, councillors were told that the developer has purchased the whole site, including the existing car parking area beside the church, and planned to create 10 dedicated spaces in total for the residents of the new flats. The large windows on the church will be replaced and the sills will be lowered to accommodate the flats on the ground floor.